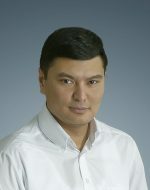 In 2008 he graduated from the Moscow State University of Civil Engineering (MGSU-MISI) with a degree in Economics, Management and Organization of Construction. From 2008 to 2016 he worked in the field of construction. He supervised the construction of industrial and civil projects. LLP "Dala Mining" (Dala Mining) from October 2016. The Koktenkol field. Intermediate site.